It’s okay, in dressage we think of ourselves as eternal students. There isn’t a day that goes by that horses don’t teach me something. I expect the same from people. I would have liked to have a friendly conversation with this cowboy, but he talked behind my back, so I didn’t get the chance. Like every other riding discipline, there are some lowlife that wear the western outfit, down to chinks and neckerchief, but don’t reflect the highest in the breed standard, if you know what I mean. Sometimes the term cowboy has a bad connotation–to cowboy a horse around usually means rough handling. We’ve all seen enough shank bit jerking, tie-down bracing, spur gouging, and general training profanity to last a life time. But there are some dressage riders I wouldn’t want to lay claim to either. Our breed standard runs the gamut, as well. Intelligent horse people should never judge an entire group by the worst example. I’m reminding myself of that right now. Dear Mr. Cowboy-outfit, a suggestion: when you see a woman with well-earned gray hair and an accent like mine, it’s a safe bet that she probably didn’t grow up in British riding yards where English saddles were the norm, or the Spanish Riding School, learning elite equestrian principles while wearing full seat breeches and tall boots. More likely, I grew up like you; I rode whatever horse I could catch on the farm. I didn’t have to choose between English and western tack, because we had none of either. Yes, I’m suggesting we may be more similar than different. I appreciate cowboys. Some of the kindest, most courteous people I know wear that Hat. 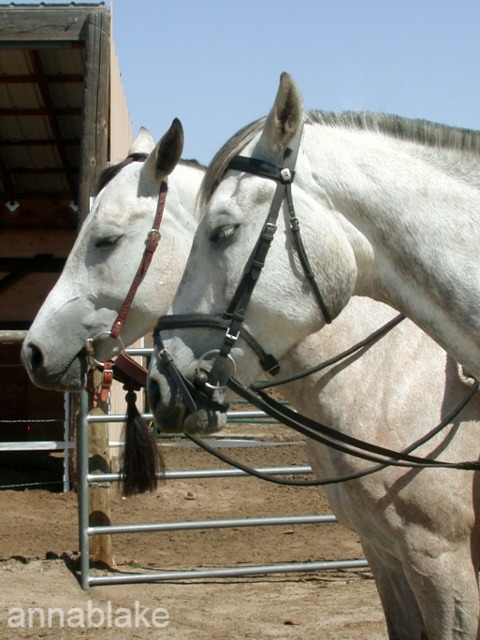 Mutual respect has always been part of that code toward both horses and other humans. And some percentage of cowboys have always trained horses using compassion and kindness, since cowboy-ing began. Dear Mr. Cowboy-outfit, suggesting that the young horse I’m working can be intimidated into work faster is certainly one method. Or maybe if you watch a moment, you’ll hear this horse tell you that violent approach was tried already and that’s when his problem got bigger. There was a time that I was happy in a western saddle, slowly building from a lope to a gallop, leaving 11’s in my wake. If you haven’t heard the term, 11’s refers to the marks on the ground left after a reining horse does a sliding stop. Yes, I’m a post-cowgirl who peeked through a door to a different kind of riding, one that intrigued me. The training process was slow but the results seemed ethereal. I decided to take my reining horses and give it a try. Dear Mr. Cowboy-outfit, cowboys didn’t actually invent horse training and not every horse will be improved by ranch work. And hard as it is to believe, there is a whole horse world out there, past the cows. It isn’t that it’s better or worse. It’s that there is always more to learn and having an open mind is the best training aid that ever existed. I knew a lifelong cowboy who was invited to a dressage barn to ride upper level horses for a month. He took the dare and when he returned, he sought me out for some gleeful dressage chat. His eyes were bright; he was filled with awe to have experienced a totally different dimension of horses. “It’s amazing what you can learn after you’ve learned all that you think there is to learn.” Ray Hunt. At the same time this week, I continued an ongoing conversation with a couple of other cowboys who are questioning the way they have always done things, wondering if there’s a better way to work with horses, and asking my opinions. Conversations like this one can be so affirming on both sides. Every time people manage to evolve a bit, horses benefit. Dear Mr. Cowboy-outfit, yes, I found a home in dressage, but I still share your heritage. America has a proud history of good horsemanship. We aren’t gangsters, we are communicators. Suggesting that a horse will benefit from speed and fear demeans good trainers of any discipline. Dear Mr. Cowboy-outfit, kindly don’t assume that because I dress differently, I’m don’t understand horses. Kindly don’t assume, because I work quietly and slowly, that I am unskilled. And because I still carry that cowboy heritage along in my dressage saddle, I wish you didn’t reflect so badly on good horsemen and horsewomen who still wear the Hat. ← Claiming My Space in a New Herd. Oh thank you, thank you for a great article. I too grew up riding on a ranch and happy to have that as a background, long before horse shows. Dressage was something we had to do before we were allowed to jump the cross country fences when I found combined training in the ’70’s. I love the concept of developing the horse and rider to be the best athlete/artist they can be, which does not include force. We really do learn something every day, whether teaching or training….a good reason to get out every day. Life is good when you are involved in good horsemanship. You are so right, the trickle down to the rest of life is wonderful. Great comment. Heheheh! One of my favorite quotes! I love hearing what you have to say. You motivate me. Your prose is like poetry. Thank you. And thank you for saying so, Barb. I mean it. I think the biggest contributor to finishing my book was all the support I got for my blog. If that makes sense…You motivate me, too! Thanks! Love, love, love what you wrote. As a western rider dipping her toe into the waters of dressage, I sometimes feel like I’m caught between two very different (and very opinionated!) worlds. This quote from a wonderful cowgirl with a heart for horses and people, Barbara Schulte, comes to mind. She shares this about her wise friend: “She always spoke of seeing other people with whom she didn’t see eye-to-eye as ‘different but not less’. This simple phrase freed my friend from judging others. Because she did not judge, she did not feel judged by those around her. It’s funny how that works.” What a world it would be if we could all do this! Thank you for my Friday Anna Fix – I don’t think I could get through the week without it! My only regret is that I want to do it all …. and probably can’t and won’t. Not for lack of trying, but because there’s just not enough time. But I can try! And yes, most people simply don’t begin to know how much they don’t know. It’s true, just when it seems we almost have a clue, another door opens. I love that part. There is a whole lot to do… but you and your horse will figure it out and the important stuff will happen. Thanks for the comment. Eloquent name calling is more like it… thanks. Really, it’s Sharks and Jets all over again. He’s a genius, like so many classical (dressage) horsemen. More in common than not, thanks. Thanks, Val. Hi to the herd! Very well written. I too started on a Percheron on grandpa’s farm, then to western doing games, etc. then really got into English in my late twenties…..I know what you’re talking about! Thank you. I have a client with a Percheron doing WD now, but her trot might be too pretty!! Nah, I would have talked him to death. You know me and dressage. Oh my I can’t even begin to tell you how this post spoke to me. Thank you for writing this. Where I live is very much a cowboy barn. I grew up riding both Western and English but preferred English. When I first came to this barn as an English rider, I definitely experienced a lot of what you speak of here. I stuck through and things changed, people started accepting me and it’s a completely different story now as you can tell from my blog. I have experienced the judgment though that you speak of here and especially the part about talking behind your back so you don’t even have the opportunity to have the conversation, the communication. Also I love the point you make that we are always students -we’re always learning. I always say if you think you know it all about horses – you’re doomed! And I couldn’t have written about my experiences of being judged and talked about more eloquently than you did here. One line that helped me through challenging times here was from a song “don’t ever let them tell you who you are”. Also I love Ray Hunt and I love the quotes of his that you used. Excellent post!!! Thanks, I think there are alot of riders like us. But we are all horse lovers (theoretically) so why fuss? okay, I know, because we’re humans. I get it. Thanks for the great comment, have fun at the WD clinic. I was raised in a totally Western Cowboy world and have just recently started English. Well, not dressage, but jumping. Most of the nicest people I know are cowboys…but then again, there’s always a sour one. I hope he shapes up before messing up the view of cowboys!!!! I will always respect cowboys. I used to be one. You, too, sounds like. Jumpers deserve some respect as well, have fun. You go girl, sometimes I also believe it is a guy thing, some of them are into it for a different reason than us. And some will do anything to win, mindless of the horse, that applies to both men and women. Some men just can’t handle an intelligent and capable woman, so they choose to act like the know everything and you don’t know anything. Don’t even waste your time, because they won’t get it anyway.I sometimes think of and feel sorry for all the poor women, living in oppression in other parts of the world who will never know or even dream about horses like we do. It was not to long ago that women were not even aloud to sit astride a horse. Men did not want us to know the empowerment of a horse. We have come a long way and still have a long way to go, but I am happy to be a woman living my horse dream and have learned to let the people like the “cowboy” blow their hot air, then I walk away, appreciate that we all have horses for different reasons and just learn something from everyone. Your blogs inspire me to write for some reason and I am sorry this is so long. Keep up the good work — I’ll get off my soapbox now. Cheers and Happy Trails. Kim B. Great comment. You are so right, we are lucky to be able to have horses. So many women have less rights than we do. Thanks, wonderful words from you. Bravo, woman! We are “all” cowboys, no matter what seat we ride. Truth. It isn’t about tack, it’s about horsemanship. Thanks. I’ve met a lot of cowboys who are students of Dressage, whether they call it that or not. My Good friend and trainer, Juilie is western through and through but she has always integrated Dressage exercises in her training. She has made me a disciple. Dressage training and cow work or for that matter, any other discipline just compliment each other. A well rounded horse is a good horse. Truly too bad he’s unlikely to see your comments – they might open his eyes a wee bit. Well said, as always. Thank you. I think he might have a certain kind of hearing loss…if you know what I mean. That’s why I love Cowboy Dressage. Combines what I love about dressage while I ride my quarter horse in a western saddle! Hooray and welcome to dressage. QH do a great job! Well said…. sadly some people are so caught up in their ego that they have ‘too tight’ a rein on their learning. …”Every time people manage to evolve a bit, horses benefit.” This pretty much sums up the most important reason why riders should show respect for different disciplines and keep an open mind and heart to learning. The horses benefit most. Beautifully stated. Forty years ago, I stumbled across a wonderful book, John Richard Young’s “Schooling of the Western Horse.” I still think it’s one of the best. Have you run across it? No, not familiar with it. Sorry, seems to be out of stock at Amazon too. “Schooling of the western horse” is available on Barnes & Noble. Search it by title not author.